The Atom, shrunk down and in his new armor, spies on the villains as they celebrate their victory. He watches as Brainiac carries out Aquaman's son. Suddenly he is detected by one of Brainiac's drones and the rest of the heroes burst into the room. The two factions crash into each other as Captain Cold transforms into Martian Manhunter and punches Grodd. Below the battle, Green Arrow and Black Canary appear, teleported out of their Metal Men shells by Zatanna. Guided by J'onn's mind, they proceed down the tunnels. Brainiac calls the heroes under his control into the battle but Zatanna summons the Doom Patrol to fight them. Batman takes down Riddler as Aquaman stabs Parasite with his trident before taking down Black Manta. In the sewers, Clayface confronts Green Arrow and Black Canary, but Arrow's shadow reveals itself to be the Elongated Man. Arrow tells Canary to go on ahead as they take out Clayface. As the heroes continue to win, the villains run to teleport to their own cities. In the sewers, Elongated Man engulfs Clayface and holds him, but he's not sure how long he can keep it up. He tells Green Arrow to go on ahead as he screams in pain. The Atom succeeds in taking down Luthor's force field, but the battle continues. 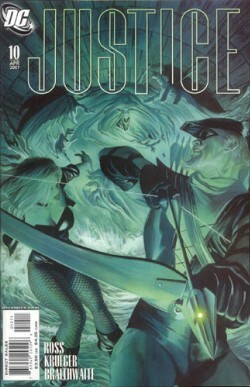 In the sewers, Green Arrow and Black Canary reach their destination and find the captured heroes. Ollie shoots his Kryptonite arrow at Supergirl, but she dodges and the arrow strikes John Stewart. Everyone is shocked, until John stands up, wearing the Green Lantern ring that Ollie just delivered to him. Story - 4: And we come to it, the first issue of Justice that I really didn't think was that good. Sure I'll still give the story a four. It still had some great bits. Teleporting Ollie and Dinah out of their armor for their covert mission was fantastic, and the Elongated shadow bit was great. Finally, John Stewart reclaiming his ring at the end was a great moment. With those all accounted for, I really need to complain about how sick I am of Alex Ross making this his personal campaign against all things Identity and Infinite Crisis related. We've seen it before in this series, and we see it again here with the use of Elongated Man. It's not Ralph being in the story, because as previously noted, I thought that hiding him as a shadow was really cool. But Green Arrow's exposition about Ralph just oozes with dislike for what has been done to him (and his wife) over the past few years at DC. It happened again when Batman takes down Riddler, screaming about how he was made to betray his friends. Maybe it's just because I'm looking for it, but this really seemed to be an attack on the whole, Batman trusts no one/OMAC story. Or maybe I'm just reading too much into it. If I am, I apologize, but I think I'm right. If they want to show that the 'classic' League is better than what DC has done to it lately, do it by writing an awesome story featuring the League. Which is exactly what they have been doing. General consensus seems to point to this being the best League story in a long time, so the point is getting across. It doesn't need that extra bit thrown in there to beat us over the head with. My only other complaint, which is actually far more important than the previous one but it doesn't annoy me as much, is the choppy nature of this issue. However, I really think that's due to panel layout more than anything, so I'll leave that to a discussion about the art. Overall, another really enjoyable issue, but a few flaws just dragged it down for me. Art - 3: This is where the issue really fell apart for me. Now the panel layout in this series has been this way since issue one, and I'll admit that it's bothered me since issue one. Sometimes unconventional diagonal panels can add a lot to the story, but sometimes I really feel that a standard four-panel page would tell the story better. However, up until this issue I never really felt like it detracted from the story. But in this issue, and especially in the first few pages of Atom flying around, I just found it disorienting. It didn't get any better during the fight either. Sure it conveys a sense of mayhem to the battle, but it also keeps me from realizing what's happening. Don't get me wrong, the painting is still beautiful, and there was some great stuff to look at in this issue, but it was just too jumbled and confusing. Cover Art - 3: This issue just can't get anything right. When I first saw this cover months ago in the previews I wondered about it, and it doesn't look any better in its final version. I can even accept the choice of covers. I think it's a little weird to choose Ollie and Dinah for a cover that features a huge fight between super powers, but I can understand that they wanted to spotlight those two Leaguers and this would be the issue to do it. But it just wasn't executed well. The entire cover is just too plain. The posing is boring, there's no action to any of it, and the color scheme is way too muted. This cover would never jump out at you. But all will be ok two months from now, when the best cover yet hits the stands.